Are you looking for quality used cars for sale near Cleveland, OH? Then you’re in the right place! At Fred Martin Superstore, we are proud to be your local Chrysler dealership serving Canton, OH and Akron, OH with the finest selection of new and used cars on the market. From a brand new 2018 Jeep® Grand Cherokee to used RAM trucks, we are sure to have the right vehicle for you. Not sure if a used car is what you’re looking for? 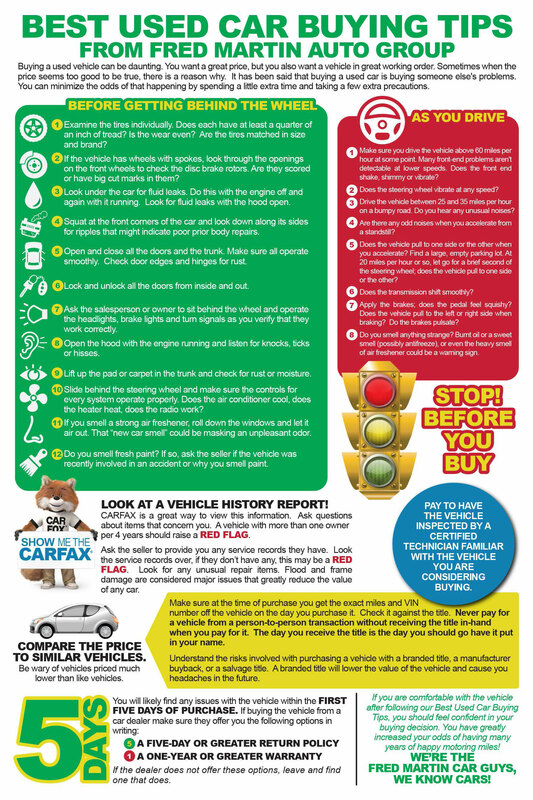 Check out the used car buying tips above! Fred Martin Superstore only stocks the highest quality cars possible, but these tips will ensure that the vehicle you drive home is up to your standards as well. Be sure to pay attention to how the car drives, any noises you hear, and always check its CARFAX report. We are also happy to do onsite vehicle inspections for any car you are considering buying. Simply search “used car dealership near me” and then head over to our dealership in Barberton, OH today!